TDS AND SENATORS have heard differing views from psychiatrists on what effects any legislation for the X Case would have on the availability of abortion in Ireland. 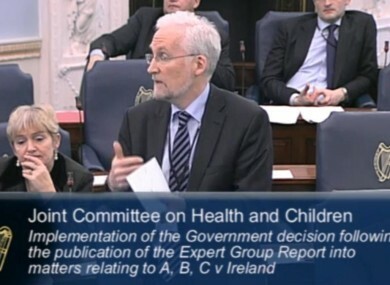 The Joint Oireachtas Committee on Health and Children heard from a number of psychiatrists specialising in perinatal treatment this afternoon as the issue of the providing for suicide in any legislation for the X Case was raised. The X Case judgement in the Supreme Court in 1992 provides for abortion in cases where there is a risk to the life of the woman including from the threat of suicide. Professor Patricia Casey, from the Department of Adult Psychiatry and UCD and the Mater Misercordiae University Hospital, said it was her belief that legislation for the X Case would lead to “widespread abortion within a short period of time”. However her view differed from others giving evidence including Dr Anthony McCarthy, consultant psychiatrist at the National Maternity Hospital, who expressed his belief that there would not be a huge increase in the number of women needing psychiatric assessment. He said that pregnant women who were feeling suicidal would still be more likely to travel to the UK to undergo a termination. Dr McCarthy said that a very small group of women are going to be so distressed and depressed that they will access an abortion in Ireland if legislation is brought in. But in the vast majority of cases “they are not going to come near us” because of the narrowness of the legislation in Ireland. “I can’t see the floodgates opening,” he added. Professor Veronica O’Keane, from the Department of Psychiatry at Tallaght Hospital, said that the majority of people are going to the UK for terminations were doing so for mental health reasons. She told the committee that there was confusion about suicide being a leading cause of death in pregnancy. She claimed it was but added that it was also rare because all death in pregnancy is rare. Professor Casey, whose membership of the conservative Iona Institute was raised by the independent senator Dr John Crown, said “there will certainly be widespread abortion within a short period of time” if the X Case is legislated for. She said this was because many pregnant women who have suicidal feelings will go to their GPs who will “in good faith” refer these women to psychiatrists for assessment. She claimed the system would be criticised for being “cumbersome” and “in due course will be opened up”. The committee also heard from the psychiatrists giving evidence that it was was not absolutely possible for any psychiatrist to determine whether or not someone was definitely going to take their own life. Dr McCarthy said that members of his profession were still best placed to make determinations on whether or not people are suicidal as they made subjective decision making based on objective facts. But Professor Casey told the Committee that numerous studies suggest “we are wrong more often than we are right”. All psychiatrists giving evidence raised the issue of a lack of psychiatrists in the country who have the expertise to treat women who are pregnant and suicidal with the three working in Dublin being the only three available in the country. Email “Psychiatrists at odds over effects of any X Case legislation”. Feedback on “Psychiatrists at odds over effects of any X Case legislation”.